This kid can cook and so much more! This is a little bonus post, you all know I had a blast being a part of America Cooks with Chefs back in December and January with my mom, right? Well, a few weeks back she got a BIG box in the mail and it was chock full of all kinds of fun pasta stuff. 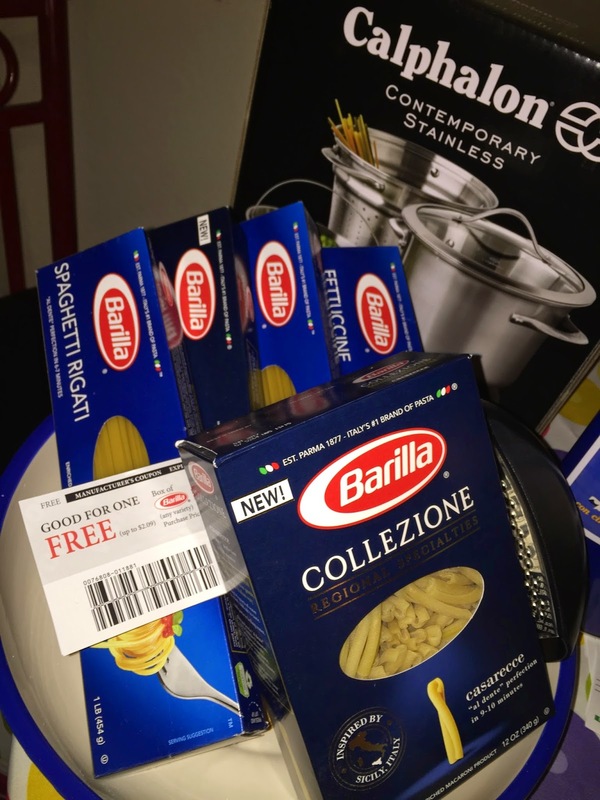 Check it out, a Calphalon pasta pot, lots of Barilla pasta including some of their special collections, a lovely pasta serving bowl, wooden utensils, a pasta tin, a cheese grater and a spoon rest. Oh, and lest I forget, a years supply of Barilla pasta! Yes, 52 free boxes of pasta! That’s alotta pasta. Some of the things I learned through my time with America Cooks and Barilla is that pasta will not make you fat, excess calories will. Pasta is a good complex carb food. When you pair pasta with high fiber vegetables, lean protein and healthy fats, you get a healthy, filling meal. Pasta is good for you and the planet. Plant-based foods including pasta have a lower environmental impact. Barilla pasta is non-GMO, I know this is important to many people. As soon as my mom opened her box, she immediately decided we were having my favorite pasta recipe for dinner, my Funky spaghetti but she makes it a little differently than I do. We used the bucatini which is like a thicker spaghetti noodle and it has a hole in the middle, yes, it’s hollow! The recipe is super simple, lots of color cherry tomatoes, olive oil (just a splash), fresh chopped garlic, basil, salt and pepper. In my version, I crush all of this together with my hands. My mom prefers to give it a few whirls in my food processor, she doesn’t like it puree’d, but a more fine, consistent chop. She adds the hot al dente pasta right from the water into the tomatoes and mixs it all up with a bit of the pasta water – it’s SO good! We eat it for dinner hot and then I dream about having lunch the next day and eating it cold. 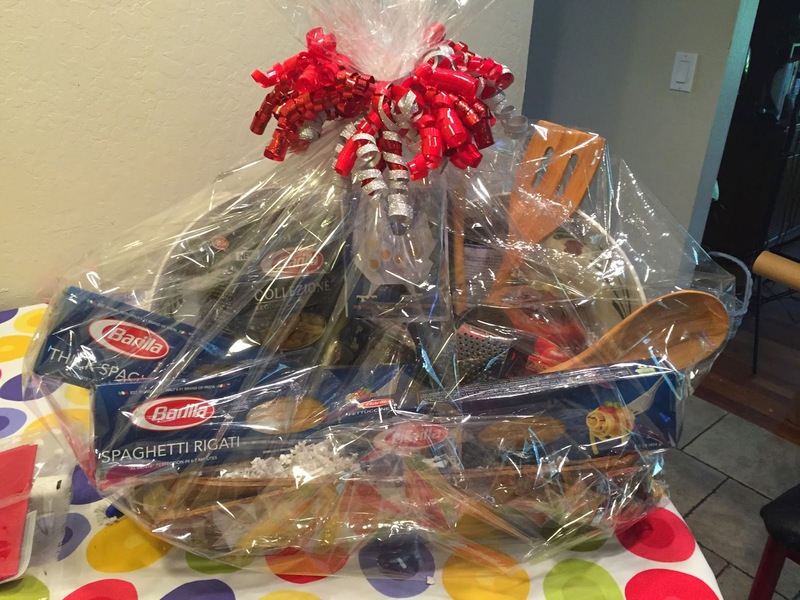 Finally, our little family of three does not need all this wonderful food so we gave some of the coupons for free pasta to our local food bank and we put together a super cool Barilla Pasta basket for my fifth grade class at what else, my schools annual spaghetti feed fundraiser! The basket brought in almost $80! Thank you Barilla and America Cooks with Chefs! You can learn more about America Cooks with Chefs and Barilla Pasta by just clicking on the links. What is your favorite pasta recipe, I would love to know! We recently tried bucatini for the first time & really liked it.